My supplier came through with more, direct from the catacombs deep within the bowels of a mysterious yet forbidden swap meet. Finally found a copy of Gymkata and '77's The Squeeze with Stacy Keach and David Hemmings. Witchtrap seems to be a screener with "SAMPLE BOX" written on the cover and no little blurb on the back stating it isn't the sequel to Witchboard like my other copy. Vampire Hookers "was" a Continental big box before it was chopped to hell, tape looks new though. Count Dracula is Franco's 1970 feature with Lee, Lom, Kinski, and Soledad Miranda on the NTA label. The plastic case was so messed up I had to swap it out and thankfully the entire cover/tape still looked great. Vigilante is on the "Pan-Canadian" label which I've never heard of. I think I have maybe six copies of Trick or Treats now...unfortunately. Haha! Pretty much, I'm right there every weekend for my fix. hey, i'm assuming you have even more copies of trick or treats by now. 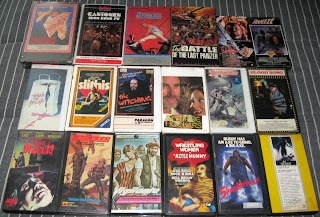 would you be willing to sell one to a fellow vhs collector cheap? i don't mind what condition it is in, just want to review the movie.